PHOTO BY JOSH SAUNDERS Mayor Lovely Warren and her supporters celebrated her Democratic Primary win at the Strathallan on September 12. 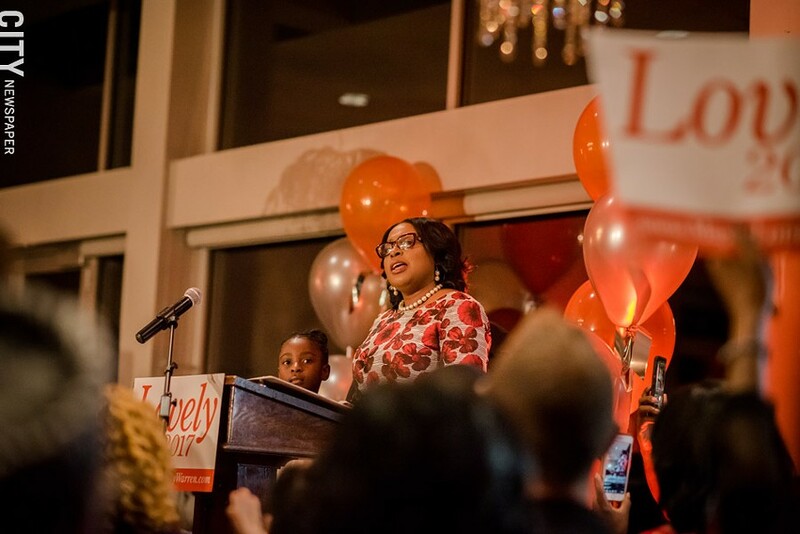 It may not be a surprise that Rochester Mayor Lovely Warren won the September 5 Democratic primary, but the margin of that win certainly surprised many people. She received more votes than those of her two opponents – County Legislator Jim Sheppard and former television reporter Rachel Barnhart – combined. And while Warren still has to face Green Party candidate Alex White and Republican Tony Micchiche in the November 7 general election, anything but a Warren win is highly unlikely. Democrats dominate voter registration – and voter interest – so heavily in the city that they've won every mayoral election since Rochester changed to a strong-mayor form of government in 1986. One subtext of the Democratic primary was the continuing division in the party: Warren, her mentor David Gantt, and their supporters on one side and a faction of strong Warren-Gantt opponents – supporters of Tom Richards in the mayoral election four years ago – on the other. The result made it clear who has the most strength in the party. And it ended any speculation about whether Barnhart hurt Sheppard's chances. won. Jackie Ortiz, who has been part of the Warren opposition on Council, was re-elected. How Warren will use her power – in city government, in the Democratic Party, and in the region – is the subject of a lot of speculation right now. It won't be long before local Democrats will start gearing up for the 2019 election, when the ballot will include all four district City Council seats, all County Legislature seats, and the county executive's position. Among the City Council members who will be on the ballot, if she decides to run again, is Molly Clifford, the northwest district's representative. Clifford was active in Jim Sheppard's campaign for mayor this year and was active in the Richards campaign for mayor four years ago. Clifford won election to her seat two years ago by a slim margin, and if the division between the two factions on Council isn't healed before the next election campaign begins, it wouldn't be a surprise if Warren supporters tried to unseat Clifford. The big political focus in 2019 will be the Monroe County executive's position, and the assumption has been that the party's candidate will be Adam Bello, currently county clerk. A Democrat would have an uphill battle under any circumstances, but if the party's division persists, a Republican will probably have an easy time. Lovely Warren has made job creation – especially for low-income city residents and for people of color – a high priority since she first ran for mayor. And assuming that she wins the general election in November, there's little question that she'll continue that push. It's a good bet that an early initiative will be asking City Council to approve the proposal by the Rochester Broadway Theatre League and Morgan Development to build a theater and an apartment building on Parcel 5 of the Midtown site. Warren favors that proposal, but getting Council's approval isn't assured. The city owns the land, and the presumption has been that a supermajority of Council has to approve its sale. Some city sources, however, are saying that handing over the ownership could be considered a "transfer," requiring only five votes. That might bring howls of protest from opposition members on Council, some arts community leaders, and others. But if Warren can show that city law permits it, she may be able to get five votes. That's not RBTL's only problem, though. It hasn't raised enough money to build a theater, and Warren may have a hard sell if she tries to get Council's approval without clear documentation that the funding is secure. One possible source for funding the theater's construction is state government, and that may bring an early test of Warren's strength and leadership skills. For years, State Assembly majority leader Joe Morelle has opposed funding a theater for RBTL, and Morelle has also sometimes been a Warren critic. It could be difficult for Warren or RBTL to get funding for a theater if Morelle doesn't support it. The City Council that begins its work in January will be different from the current one in some key ways. It's losing valuable institutional knowledge with the retirement of three-term Council member and former city clerk Carolee Conklin. It's also losing its sole representative from the LGBTQ community: Matt Haag is retiring after two terms, and the LGBTQ representative who might have replaced him, Matt Juda, finished ninth in the 13-person race. A little suspense about the new Council: whether Warren can now count on support from a reliable majority. Currently, four of the nine members are predictable Warren votes, but four others are not, and Carolee Conklin has served as a swing vote. On the new Council, Warren will have firm support from Loretta Scott, Adam McFadden, Michael Patterson, and new member Willie Joe Lightfoot. Likely to oppose Warren on some issues: Jackie Ortiz, Elaine Spaull, and Molly Clifford. Two new Council members – Mitch Gruber and Malik Evans – could be more independent, and during the campaign, both said they would be. Both were on Warren's slate of Council candidates for the primary election, however, and both received campaign contributions from her. One other takeaway from the Council election results: Despite the enthusiasm created by Bernie Sanders' presidential campaign, it's hard for newcomers to win elections. The retirement of Conklin and Haag opened the door for some new blood on Council. And it drew an unusually large number of candidates – 13 – for the five seats on the Democratic primary ballot. Eight of them had never held elected office. Name recognition seemed to matter in the Rochester school board race as well. There may be plenty of voter dissatisfaction about the board and the district, but when voters had a chance to turn out two incumbents on September 5, they refused to do it. School board president Van White and vice president Cynthia Elliott won handily. The third seat went to newcomer Natalie Sheppard, who had received backing from Warren. Losing: Cecilia Golden, a former district administrator; Beatriz LeBron; and Sabrina Lamar. And it won't be long before city residents will be asked to go back to the polls for yet another school board election. Malik Evans, who has served two years of his current four-year term, will leave the board in January to join City Council. The rest of the board will appoint a replacement, but that person will serve only until a special election is held. The winner of that election will fill out whatever is left of Evans' term.